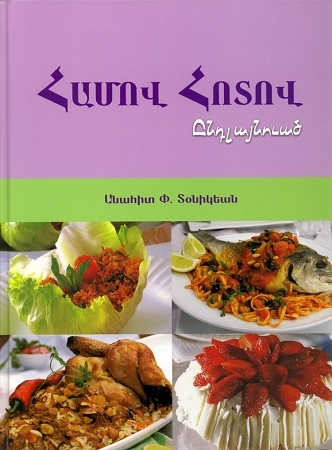 Համով Հոտով is a comprehensive cookbook written in Western Armenian. Through her recipes, Doniguian introduces readers to the culinary traditions of people around the world. Although this book includes many Armenian and Middle Eastern recipes, dishes from Indonesia, France, Italy and Thailand and the United States, among many countries, also feature prominently in the cookbook. Each recipe is accompanied by a vivid, glossy photograph of the completed dish in all its glory. The cookbook includes recipes for every occasion and skill level.